For other uses, see Woodpecker (disambiguation). Woodpeckers are part of the family Picidae, a group of near-passerine birds that also consist of piculets, wrynecks, and sapsuckers. Members of this family are found worldwide, except for Australia, New Guinea, New Zealand, Madagascar, and the extreme polar regions. Most species live in forests or woodland habitats, although a few species are known that live in treeless areas, such as rocky hillsides and deserts, and the Gila woodpecker specialises in exploiting cacti. Members of this family are chiefly known for their characteristic behaviour. They mostly forage for insect prey on the trunks and branches of trees, and often communicate by drumming with their beak, producing a reverberatory sound that can be heard at some distance. Some species vary their diet with fruits, birds' eggs, small animals, and tree sap. They mostly nest and roost in holes that they excavate in tree trunks, and their abandoned holes are of importance to other cavity-nesting birds. They sometimes come into conflict with humans when they make holes in buildings or feed on fruit crops, but perform a useful service by their removal of insect pests on trees. The Picidae are one of nine living families in the order Piciformes, the others being barbets (comprising three families), toucans, toucan-barbets, and honeyguides which (along with woodpeckers) comprise the clade Pici, and the jacamars and puffbirds in the clade Galbuli. DNA sequencing has confirmed the sister relationships of these two groups. The family Picidae includes about 240 species arranged in 35 genera. Almost 20 species are threatened with extinction due to loss of habitat or habitat fragmentation, with one, the Bermuda flicker, being extinct and a further two probably being so. Woodpeckers range from tiny piculets measuring no more than 7 cm (2.8 in) in length and weighing 7 g (0.25 oz) to large woodpeckers which can be more than 50 cm (20 in) in length. The largest surviving species is the great slaty woodpecker, which weighs 360–563 g (12.7–19.9 oz), but probably the extinct imperial woodpecker and ivory-billed woodpecker were both larger. The plumage of woodpeckers varies from drab to conspicuous. The colours of many species are based on olive and brown and some are pied, suggesting a need for camouflage; others are boldly patterned in black, white and red, and many have a crest or tufted feathers on the crown. Woodpeckers tend to be sexually dimorphic, but differences between the sexes are generally small; exceptions to this are Williamson's sapsucker and the orange-backed woodpecker, which differ markedly. The plumage is moulted fully once a year apart from the wrynecks, which have an additional partial moult before breeding. Woodpeckers, piculets and wrynecks all possess characteristic zygodactyl feet, consisting of four toes, the first (hallux) and the fourth facing backward and the second and third facing forward. This foot arrangement is good for grasping the limbs and trunks of trees. Members of this family can walk vertically up tree trunks, which is beneficial for activities such as foraging for food or nest excavation. In addition to their strong claws and feet, woodpeckers have short, strong legs. This is typical of birds that regularly forage on trunks. Exceptions are the black-backed woodpecker and the American and Eurasian three-toed woodpeckers, which have only three toes on each foot. The tails of all woodpeckers, except the piculets and wrynecks, are stiffened, and when the bird perches on a vertical surface, the tail and feet work together to support it. Woodpeckers have strong bills for drilling and drumming on trees, and long sticky tongues for extracting food (insects and larvae). Woodpecker bills are typically longer, sharper and stronger than the bills of piculets and wrynecks; however, their morphology is very similar. The bill's chisel-like tip is kept sharp by the pecking action in birds that regularly use it on wood. The beak consists of three layers; an outer sheath called rhamphotheca, made of scales formed from keratin proteins, an inner layer of bone which has a large cavity and mineralised collagen fibers, and a middle layer made of porous bone which connects the two other layers. Furthermore, woodpeckers' tongues are very long, and wind around the skull through a special cavity, thereby cushioning the brain. 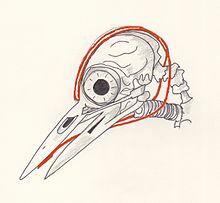 Combined, this anatomy helps the beak absorb mechanical stress. Species of woodpecker and flicker that use their bills in soil or for probing as opposed to regular hammering tend to have longer and more decurved bills. Due to their smaller bill size, many piculets and wrynecks will forage in decaying wood more often than woodpeckers. Their long sticky tongues, which possess bristles, aid these birds in grabbing and extracting insects from deep within a hole in a tree. It has been reported that the tongue was used to spear grubs, but more detailed studies published in 2004 have shown that the tongue instead wraps around the prey before being pulled out. Many of the foraging, breeding and signaling behaviors of woodpeckers involve drumming and hammering using the bill. To prevent brain damage from the rapid and repeated powerful impacts, woodpeckers have a number of physical features which protect the brain. These include a relatively small and smooth brain, narrow subdural space, little cerebrospinal fluid (CSF) surrounding it to prevent it from moving back and forth inside the skull during pecking, the orientation of the brain within the skull (which maximises the contact area between the brain and the skull) and the short duration of contact. The skull consists of strong but compressible sponge-like bone which is most concentrated in the forehead and the back of the skull. Another anatomical adaptation of woodpeckers is the enormously elongated hyoid bone which subdivides, passes on either side of the spinal column and wraps around the brain case, before ending in the right nostril cavity. It plays the role of safety-belt. Computer simulations have shown that 99.7 percent of the energy generated in pecking is stored in the form of strain energy, which is distributed throughout the bird's body, with only a small remaining fraction of the energy going into the brain. The pecking also causes the woodpecker's skull to heat up, which is part of the reason why they often peck in short bursts with brief breaks in between, giving the head some time to cool. During the millisecond before contact with wood, a thickened nictitating membrane closes, protecting the eye from flying debris. These membranes also prevent the retina from tearing. The nostrils are also protected; they are often slit-like and have special feathers to cover them. Woodpeckers are capable of repeated pecking on a tree at high decelerations in the order of 10,000 m/s2 (33,000 ft/s2) (1000 g). Some large woodpeckers such as Dryocopus have a fast, direct form of flight, but the majority of species have a typical undulating flight pattern consisting of a series of rapid flaps followed by a swooping glide. Many birds in the genus Melanerpes have distinctive, rowing wing-strokes while the piculets engage in short bursts of rapid direct flight. 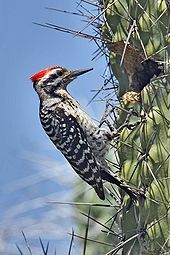 Use of cacti for breeding and roosting holes allows some woodpeckers to live in treeless deserts, like the ladder-backed woodpecker which uses cacti for nesting. Woodpeckers have a mostly cosmopolitan distribution, although they are absent from Australasia, Madagascar, and Antarctica. They are also absent from some of the world's oceanic islands, although many insular species are found on continental islands. The true woodpeckers, subfamily Picinae, are distributed across the entire range of the family. The Picumninae piculets have a pantropical distribution, with species in Southeast Asia, Africa, and the Neotropics, with the greatest diversity being in South America. The second piculet subfamily, Nesoctitinae, has a single member, the Antillean piculet, which is restricted to the Caribbean island of Hispaniola. The wrynecks (Jynginae) are found exclusively in the Old World, with the two species occurring in Europe, Asia, and Africa. The majority of woodpeckers are sedentary but there are a few examples of migratory species such as the rufous-bellied woodpecker and yellow-bellied sapsucker, and the Eurasian wryneck breeds in Europe and west Asia and migrates to the Sahel in Africa in the winter. More northerly populations of Lewis's woodpecker, northern flicker, Williamson's sapsucker, red-breasted sapsucker and red-naped sapsucker all move southwards in the fall in North America. Most woodpecker movements can be described as dispersive, such as when young birds seek territories after fledging, or eruptive, to escape harsh weather conditions. Several species are altitudinal migrants, for example the grey-capped woodpecker, which moves to lowlands from hills during the winter months. The woodpeckers that do migrate do so during the day. Overall, woodpeckers are arboreal birds of wooded habitats. They reach their greatest diversity in tropical rainforests, but occur in almost all suitable habitats including woodlands, savannahs, scrublands, and bamboo forests. Even grasslands and deserts have been colonised by various species. These habitats are more easily occupied where a small number of trees exist, or, in the case of desert species like the Gila woodpecker, tall cacti are available for nesting. Some are specialists and are associated with coniferous or deciduous woodland or even, like the acorn woodpecker, with individual tree genera (oaks in this case). Other species are generalists and are able to adapt to forest clearance by exploiting secondary growth, plantations, orchards and parks. In general, forest-dwelling species need rotting or dead wood on which to forage. A number of species are adapted to spending a portion of their time feeding on the ground, and a very small minority have abandoned trees entirely and nest in holes in the ground. The ground woodpecker is one such species, inhabiting the rocky and grassy hills of South Africa, and the Andean flicker is another. The Swiss Ornithological Institute has set up a monitoring program to record breeding populations of woodland birds. This has shown that deadwood is an important habitat requirement for the black woodpecker, great spotted woodpecker, middle spotted woodpecker, lesser spotted woodpecker, European green woodpecker and Eurasian three-toed woodpecker. Populations of all these species increased by varying amounts in the period 1990 to 2008. During this period, the amount of deadwood in the forest increased and the range of the white-backed woodpecker enlarged as it extended eastwards. With the exception of the green and middle spotted woodpeckers, the increase in the amount of deadwood is likely to be the major factor explaining the population increase of these species. The majority of woodpeckers live solitary lives, but the spectrum of behaviour ranges from highly antisocial species that are aggressive towards their own kind, to species that live in groups. Solitary species will defend such feeding resources as a termite colony or fruit laden tree, driving away other conspecifics and returning frequently until the resource is exhausted. Aggressive behaviours include bill-pointing and jabbing, head shaking, wing flicking, chasing, drumming and vocalisations. Ritual actions do not usually result in contact and birds may "freeze" for a while before they resume their dispute. The coloured patches may be flouted, and in some instances, these antagonistic behaviours resemble courtship rituals. Group-living species tend to be communal group breeders. In addition to these species, a number of species may join mixed-species foraging flocks with other insectivorous birds, although they tend to stay at the edges of these groups. Joining these flocks allows woodpeckers to decrease their anti-predator vigilance and increase their feeding rate. Woodpeckers are diurnal, roosting at night inside holes and crevices. In many species the roost will become the nest-site during the breeding season, but in some species they have separate functions; the grey-and-buff woodpecker makes several shallow holes for roosting which are quite distinct from its nesting site. Most birds roost alone and will oust intruders from their chosen site, but the Magellanic woodpecker and acorn woodpecker are cooperative roosters. Drumming is a form of non-vocal communication used by most species of woodpecker and involves the bill being repeatedly struck on a hard surface with great rapidity. After a pause, the drum roll is repeated, each species having a pattern which is unique in the number of beats in the roll, the length of the roll, the length of the gap between rolls and the cadence. The drumming is mainly a territorial call, equivalent to the song of a passerine, with male birds drumming more frequently than females. Woodpeckers choose a surface that resonates, such as a hollow tree, and may use man-made structures such as gutters and downpipes. Drumming serves for the mutual recognition of conspecifics and plays a part in courtship rituals. Individual birds are thought to be able to distinguish the drumming of their mates and that of their neighbours. Woodpeckers do not have such a wide range of songs and calls as do passerine birds, and the sounds they make tend to be simpler in structure. Calls produced include brief high-pitched notes, trills, rattles, twittering, whistling, chattering, nasal churrs, screams and wails. These calls are used by both sexes in communication and are related to the circumstances of the occasion; these include courtship, territorial disputes and alarm calls. Each species has its own range of calls, which tend to be in the 1 to 2.5 kHz range for efficient transmission through forested environments. Mated couples may exchange muted, low-pitched calls, and nestlings often issue noisy begging-calls from inside their nest cavity. The wrynecks have a more musical song and in some areas, the song of the newly arrived Eurasian wryneck is considered to be the harbinger of spring. The piculets either have a song consisting of a long descending trill, or a descending series of two to six (sometimes more) individual notes, and this song alerts ornithologists to the presence of the birds, as they are easily overlooked. The majority of woodpecker species live up to their name and feed on insects and other invertebrates living under bark and in wood, but overall the family is characterized by its dietary flexibility, with many species being both highly omnivorous and opportunistic. The diet includes ants, termites, beetles and their larvae, caterpillars, spiders, other arthropods, bird eggs, nestlings, small rodents, lizards, fruit, nuts and sap. Many insects and their grubs are taken from living and dead trees by excavation. The bird may hear sounds from inside the timber indicating where it will be productive to create a hole. Other means are also used to garner prey. Some species, such as the red-naped sapsucker, sally into the air to catch flying insects, and many species probe into crevices and under bark, or glean prey from leaves and twigs. The rufous woodpecker specialises in attacking the nests of arboreal ants and the buff-spotted woodpecker feeds on and nests in termite mounds. Other species such as the wrynecks and the Andean flicker feed wholly or partly on the ground. Ecologically, woodpeckers help to keep trees healthy by keeping them from suffering mass infestations. The family is noted for its ability to acquire wood-boring grubs from the trunks and branches, whether the timber is alive or dead. Having hammered a hole into the wood, the prey is extracted by use of a long, barbed tongue. Woodpeckers consume beetles that burrow into trees, removing as many as 85 percent of emerald ash borer larvae from individual ash trees. The ability to excavate allows woodpeckers to obtain tree sap, an important source of food for some species. Most famously, the sapsuckers (genus Sphyrapicus) feed in this fashion, but the technique is not restricted to these, and others such as the acorn woodpecker and white-headed woodpecker also feed on sap. It was once thought that the technique was restricted to the New World, but Old World species, such as the Arabian woodpecker and great spotted woodpecker, also feed in this way. All members of the family Picidae nest in cavities, nearly always in the trunks and branches of trees, well away from the foliage. Where possible, an area of rotten wood surrounded by sound timber is used. Where trees are in short supply, the gilded flicker and ladder-backed woodpecker excavate holes in cactus and the Andean flicker and ground woodpecker dig holes in earth banks. The campo flicker sometimes chooses termite mounds, the rufous woodpecker prefers to use ants nests in trees and the bamboo woodpecker specialises in bamboos. Woodpeckers also excavate nest holes in residential and commercial structures as well as wooden utility poles. Woodpeckers and piculets will excavate their own nests, but wrynecks will not, and need to find pre-existing cavities. A typical nest has a round entrance hole that just fits the bird, leading to an enlarged vertical chamber below. No nesting material is used, apart from some wood chips produced during the excavation; other wood chips are liberally scattered on the ground providing visual evidence of the site of the nest. Many species of woodpeckers excavate one hole per breeding season, sometimes after multiple attempts. It takes around a month to finish the job and abandoned holes are used by other birds and mammals that are cavity nesters unable to excavate their own holes. 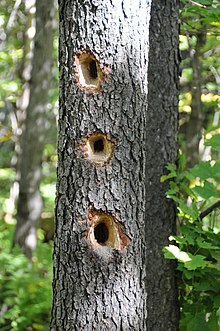 Cavities are in great demand for nesting by other cavity nesters, so woodpeckers face competition for the nesting sites they excavate from the moment the hole becomes usable. This may come from other species of woodpecker, or other cavity nesting birds like swallows and starlings. Woodpeckers may aggressively harass potential competitors, and also use other strategies to reduce the chance of being usurped from their nesting site; for example the red-crowned woodpecker digs its nest in the underside of a small branch, which reduces the chance that a larger species will take it over and expand it. Members of Picidae are typically monogamous, with a few species breeding cooperatively and some polygamy reported in a few species. 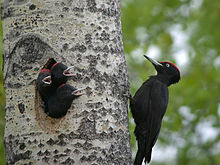 Polyandry, where a female raises two broods with two separate males, has also been reported in the West Indian woodpecker. Another unusual social system is that of the acorn woodpecker, which is a polygynandrous cooperative breeder where groups of up to 12 individuals breed and help to raise the young. Young birds from previous years may stay behind to help raise the group's young, and studies have found reproductive success for the group goes up with group size, but individual success goes down. Birds may be forced to remain in groups due to a lack of habitat to disperse to. A pair will work together to help build the nest, incubate the eggs and raise their altricial young. However, in most species the male does most of the nest excavation and takes the night shift while incubating the eggs. A clutch will usually consist of two to five round white eggs. Since these birds are cavity nesters, their eggs do not need to be camouflaged and the white color helps the parents to see them in dim light. The eggs are incubated for about 11–14 days before they hatch. It then takes about 18–30 days before the chicks are fully fledged and ready to leave the nest. In most species, soon after this the young are left to fend for themselves, exceptions being the various social species, and the Hispaniolan woodpecker, where adults continue to feed their young for several months. In general, cavity nesting is a successful strategy and a higher proportion of young are reared than is the case with birds that nest in the open. In Africa, several species of honeyguide are brood parasites of woodpeckers. The Picidae are just one of eight living families in the order Piciformes. Other members of this group, such as the jacamars, puffbirds, barbets, toucans, and honeyguides, have traditionally been thought to be closely related to the woodpecker family (true woodpeckers, piculets, wrynecks and sapsuckers). The clade Pici (woodpeckers, barbets, toucans, and honeyguides) is well supported and shares a zygodactyl foot with the Galbuli (puffbirds and jacamars). More recently, several DNA sequence analyses have confirmed that Pici and Galbuli are sister groups. The family Picidae was introduced by the English zoologist William Elford Leach in a guide to the contents of the British Museum published in 1820. The phylogeny has been updated according to new knowledge about convergence patterns and evolutionary history. Most notably, the relationship of the picine genera has been largely clarified, and it was determined that the Antillean piculet is a surviving offshoot of proto-woodpeckers. Genetic analysis supports the monophyly of Picidae, which seems to have originated in the Old World, but the geographic origins of the Picinae is unclear. The Picumninae is returned as paraphyletic. Morphological and behavioural characters, in addition to DNA evidence highlights genus Hemicircus as the sister group of all remaining true woodpeckers, besides a sister-group relationship between the true woodpecker tribes Dendropicini and Malarpicini. The evolutionary history of this group is not well documented, but the known fossils allow some preliminary conclusions: the earliest known modern picids were piculet-like forms of the Late Oligocene, about 25 million years ago (mya). By that time, however, the group was already present in the Americas and Europe, and it is hypothesized that they actually evolved much earlier, maybe as early as the Early Eocene (50 mya). The modern subfamilies appear to be rather young by comparison; until the mid-Miocene (10–15 mya), all picids seem to have been small or mid-sized birds similar to a mixture between a piculet and a wryneck. On the other hand, there exists a feather enclosed in fossil amber from the Dominican Republic, dated to about 25 mya, which seems to indicate that the Nesoctitinae were already a distinct lineage by then. Stepwise adaptations for drilling, tapping and climbing head first on vertical surfaces have been suggested. The last common ancestor of woodpeckers (Picidae) was incapable of climbing up tree trunks or excavating nest cavities by drilling with its beak. The first adaptations for drilling (including reinforced rhamphotheca, frontal overhang and processus dorsalis pterygoidei) evolved in the ancestral lineage of piculets and true woodpeckers. Additional adaptations for drilling and tapping (enlarged condylus lateralis of the quadrate and fused lower mandible) have evolved in the ancestral lineage of true woodpeckers (Hemicircus excepting). The inner rectrix pairs became stiffened, and the pygostyle lamina was enlarged in the ancestral lineage of true woodpeckers (Hemicircus included), which facilitated climbing head first up tree limbs. Genus Hemicircus excepting, the tail feathers were further transformed for specialized support, the pygostyle disc became greatly enlarged, and the ectropodactyl toe arrangement evolved. These latter characters may have facilitated enormous increases in body size in some lineages. Prehistoric representatives of the extant Picidae genera are treated in the genus articles. An enigmatic form based on a coracoid found in Pliocene deposits of New Providence in the Bahamas, has been described as Bathoceleus hyphalus and probably also is a woodpecker. The phylogeny of woodpeckers is still being refined and the positions of some genera continue to be unclear and there are conflicting findings from analyses as of 2016.
cf. Colaptes DMNH 1262 (Early Pliocene of Ainsworth, US) – malarpicine? In general, humans consider woodpeckers in a favourable light; they are viewed as interesting birds and fascinating to watch as they drum or forage. However, their activities are not universally appreciated. Many woodpecker species are known to excavate holes in buildings, fencing and utility poles, creating health and/or safety issues for affected buildings and utility poles. Such activity is very difficult to discourage and can be costly to repair. Woodpeckers also drum on various reverberatory structures on buildings such as gutters, downspouts, chimneys, vents and aluminium sheeting. Drumming is a less-forceful type of pecking that serves to establish territory and attract mates. Houses with shingles or wooden boarding are also attractive as possible nesting or roosting sites, especially when close to large trees or woodland. Several exploratory holes may be made, especially at the junctions of vertical boards or at the corners of tongue-and-groove boarding. The birds may also drill holes in houses as they forage for insect larvae and pupae hidden behind the woodwork. Woodpeckers sometimes cause problems when they raid fruit crops, but their foraging activities are mostly beneficial as they control forest insect pests such as the woodboring beetles that create galleries behind the bark and can kill trees. They also eat ants, which may be tending sap-sucking pests such as mealybugs, as is the case with the rufous woodpecker in coffee plantations in India. Woodpeckers can serve as indicator species, demonstrating the quality of the habitat. Their hole-making abilities make their presence in an area an important part of the ecosystem, because these cavities are used for breeding and roosting by many bird species that are unable to excavate their own holes, as well as being used by various mammals and invertebrates. The spongy bones of the woodpecker's skull and the flexibility of its beak, both of which provide protection for the brain when drumming, have provided inspiration to engineers; a black box needs to survive intact when a plane falls from the sky, and modelling the black box with regard to a woodpecker's anatomy has increased the resistance of this device to damage sixty-fold. The design of protective helmets is another field being influenced by the study of woodpeckers. One of the accounts of the Founding of Rome, preserved in the work known as Origo Gentis Romanae, refers to a legend of a woodpecker bringing food to the boys Romulus and Remus during the time they were abandoned in the wild – thus enabling them to survive and play their part in history. In a global survey of the risk of extinction faced by the various bird families, woodpeckers were the only bird family to have significantly fewer species at risk than would be expected. Nevertheless, several woodpeckers are under threat as their habitats are destroyed. Being woodland birds, deforestation and clearance of land for agriculture and other purposes can reduce populations dramatically. Some species adapt to living in plantations and secondary growth, or to open countryside with forest remnants and scattered trees, but some do not. A few species have even flourished when they have adapted to man-made habitats. There are few conservation projects directed primarily at woodpeckers, but they benefit whenever their habitat is conserved. The red-cockaded woodpecker has been the focus of much conservation effort in the southeastern United States, with artificial cavities being constructed in the longleaf pines they favour as nesting sites. Two species of woodpeckers in the Americas, the ivory-billed woodpecker and the imperial woodpecker, have been considered extinct since the mid-to-late 20th century, though there have been possible but disputed sightings of ivory-billed woodpeckers in the United States since 2004, and a small population may survive in Cuba. Another critically endangered species is the Okinawa woodpecker from Japan, with a single declining population of a few hundred birds. It is threatened by deforestation, golf course, dam and helipad construction, road building and agricultural development. ^ The taxonomic committee of the British Ornithologists' Union have recommended an arrangement in which the genera Dendrocoptes and Leiopicus are combined into a larger Dendropicos. ^ Helmenstine, Todd (8 May 2014). "Woodpecker Beak Shock Absorbers". Science Notes. Retrieved 24 July 2017. ^ Villard, Pascal; Cuisin, Jacques (2004). "How do woodpeckers extract grubs with their tongues? A study of the Guadeloupe woodpecker (Melanerpes herminieri) in the French Indies". Auk. 121 (2): 509–514. doi:10.1642/0004-8038(2004)121[0509:HDWEGW]2.0.CO;2. ^ Gibson, L. (2006). "Woodpecker pecking: how woodpeckers avoid brain injury". Journal of Zoology. 270 (3): 462–465. doi:10.1111/j.1469-7998.2006.00166.x. ^ a b Puiu, Tibi (23 March 2017). "Why woodpeckers don't get headaches". ZME Science. Retrieved 24 July 2017. ^ Gammon, Katharine (25 August 2014). "Woodpecker Bodies Cushion Collision Impact On Bird Brains". Inside Science. Retrieved 24 July 2017. ^ Schwab, I. (2002). "Cure for a headache". British Journal of Ophthalmology. 86 (8): 843. doi:10.1136/bjo.86.8.843. PMC 1771249. ^ Gibson, L.J. (2006). "Woodpecker pecking: how woodpeckers avoid brain injury". Journal of Zoology. 270 (3): 462–465. doi:10.1111/j.1469-7998.2006.00166.x. ^ Reichlin, Thomas; Schaub, Michael; Menz, Myles H. M.; Mermod, Murielle; Portner, Patricia; Arlettaz, Raphaël; Jenni, Lukas (2008). "Migration patterns of Hoopoe Upupa epops and Wryneck Jynx torquilla : an analysis of European ring recoveries" (PDF). Journal of Ornithology. 150 (2): 393–400. doi:10.1007/s10336-008-0361-3. ^ Korol, Jerome; Hutto, Richard (1984). "Factors Affecting Nest Site Location in Gila Woodpeckers" (PDF). Condor. 86 (1): 73–78. doi:10.2307/1367350. JSTOR 1367350. ^ Short, Lester (1971). "The evolution of terrestrial woodpeckers". American Museum Novitates. 2467. ^ Kimberly, Sullivan (1984). "Information Exploitation By Downy Woodpeckers in Mixed-Species Flocks". Behavior. 91 (4): 294–311. doi:10.1163/156853984X00128. ^ Williams, Ernest H. Jr. (2005). The Nature Handbook: A Guide to Observing the Great Outdoors. Oxford University Press. p. 118. ISBN 978-0-19-972075-0. ^ Sarkar, A. (2003). Fundamentals Of Animals Behaviour. Discovery Publishing House. p. 264. ISBN 978-81-7141-742-1. ^ Noel, Thomas (1841). Rymes and Roundelayes. Smith. p. 144. ^ Hilty, Steven L. (2002). Birds of Venezuela. Princeton University Press. p. 464. ISBN 978-1-4008-3409-9. ^ a b Graham, Rex (24 July 2014). "Resilient Woodpeckers hard to knock – or stop". Birds News. Archived from the original on 4 April 2016. Retrieved 24 March 2016. ^ Kotaka, N.; Matsuoka, S. (2002). "Secondary users of Great Spotted Woodpecker (Dendrocopos major) nest cavities in urban and suburban forests in Sapporo City, northern Japan". Ornithological Science. 1 (2): 117–122. doi:10.2326/osj.1.117. ^ Short, Lester L. (1979). "Burdens of the Picid Hole-Excavating Habit" (PDF). Wilson Bulletin. 91 (1): 16–28. ^ Wiktander, Ulf; Olsson, Ola; Nilsson, Sven G. (2000). "Parental care and social mating system in the Lesser Spotted Woodpecker Dendrocopos minor". Journal of Avian Biology. 31 (4): 447–456. doi:10.1034/j.1600-048X.2000.310003.x. ^ Willimont, L. A.; Jackson, J. A.; Jackson, B. J. S. (1991). "Classical polyandry in the West Indian woodpecker on Abaco, Bahamas" (PDF). Wilson Bulletin. 103: 124–125. ^ Koenig, Walter D. (1981). "Reproductive success, group size, and the evolution of cooperative breeding in the acorn woodpecker". The American Naturalist. 117 (4): 421–443. doi:10.1086/283726. JSTOR 2460453. ^ Johansson, U.S.; Ericson, G.P. (2003). "Molecular support for a sister group relationship between Pici and Galbulae (Piciformes sensu Wetmore 1960)" (PDF). Journal of Avian Biology. 34 (2): 185–197. doi:10.1034/j.1600-048X.2003.03103.x. ^ Bock, Walter J. (1994). History and Nomenclature of Avian Family-Group Names. Bulletin of the American Museum of Natural History. Number 222. New York: American Museum of Natural History. pp. 146, 192. ^ Moore, William S.; Weibel, Amy C.; Agius, Andrea (2006). "Mitochondrial DNA phylogeny of the woodpecker genus Veniliornis (Picidae, Picinae) and related genera implies convergent evolution of plumage patterns" (PDF). Biological Journal of the Linnean Society. 87 (4): 611–624. doi:10.1111/j.1095-8312.2006.00586.x. ^ a b c Manegold, Albrecht; Töpfer, Till (February 2013). "The systematic position of Hemicircus and the stepwise evolution of adaptations for drilling, tapping and climbing up in true woodpeckers (Picinae, Picidae)". Journal of Zoological Systematics and Evolutionary Research. 51 (1): 72–82. doi:10.1111/jzs.12000. Retrieved 6 July 2018. ^ Grimaldi, David A.; Case, Gerard Ramon (1995). "A feather in amber from the Upper Cretaceous of New Jersey" (PDF). American Museum Novitates. 3126: 1–6. ^ Cracraft, Joel; Morony, John J. Jr. (1969). "A new Pliocene woodpecker, with comments on the fossil Picidae" (PDF). American Museum Novitates. 2400: 1–8. ^ Dufort, Matthew J. (2016). "An augmented supermatrix phylogeny of the avian family Picidae reveals uncertainty deep in the family tree". Molecular Phylogenetics and Evolution. 94 (Pt A): 313–326. doi:10.1016/j.ympev.2015.08.025. PMID 26416706. ^ Webb, David Matthew; Moore, William S. (2005). "A phylogenetic analysis of woodpeckers and their allies using 12S, Cyt b, and COI nucleotide sequences (class Aves; order Piciformes)". Molecular Phylogenetics and Evolution. 36 (2): 233–248. doi:10.1016/j.ympev.2005.03.015. PMID 15869887. ^ Fuchs, Jérôme; I. Ohlson, Jan; G. P. Ericson, Per; Pasquet, Eric (2006-09-01). "Molecular phylogeny and biogeographic history of the piculets (Piciformes: Picumninae)". Journal of Avian Biology. 37 (5): 487–496. CiteSeerX 10.1.1.494.3155. doi:10.1111/j.0908-8857.2006.03768.x. ^ Sangster, G.; et al. (2016). "Taxonomic recommendations for Western Palearctic birds: 11th report". Ibis. 158 (1): 206–212. doi:10.1111/ibi.12322. ^ a b "Stopping Woodpecker Damage". Joy of \Birds. March 22, 2018. Retrieved April 27, 2018. ^ a b "Three Reasons Why Woodpeckers Drill Holes on Houses". Woodpeckers. Cornell Lab of Ornithology. 2002. Retrieved 6 July 2017. ^ a b Gregory, Josh (2012). From Woodpeckers to... Helmets. Cherry Lake. pp. 24–26. ISBN 978-1-61080-582-7. ^ Bennett, P. M.; Owens, I. P. F. (22 March 1997). "Variation in extinction risk among birds: chance or evolutionary predisposition?". Proceedings of the Royal Society B: Biological Sciences. 264 (1380): 401–408. doi:10.1098/rspb.1997.0057. PMC 1688257. ^ Carole K. Copeyon; Jeffrey R. Walters; J. H. Carter III (1991). "Induction of Red-Cockaded Woodpecker Group Formation by Artificial Cavity Construction". The Journal of Wildlife Management. 55 (4): 549–556. doi:10.2307/3809497. JSTOR 3809497. ^ "The search for the ivory-billed woodpecker". Big Woods Conservation Partnership. Retrieved 2017-03-26. ^ BirdLife International (2016). "Campephilus principalis". The IUCN Red List of Threatened Species. 2016: e.T22681425A92906044. doi:10.2305/IUCN.UK.2016-3.RLTS.T22681425A92906044.en. Retrieved 15 January 2018. Gorman, Gerard (2014). Woodpeckers of the World: A Photographic Guide. Firefly Books. ISBN 978-1-77085-309-6. Dufort, M.J. (2016). "An augmented supermatrix phylogeny of the avian family Picidae reveals uncertainty deep in the family tree". Molecular Phylogenetics and Evolution. 94 (Pt A): 313–326. doi:10.1016/j.ympev.2015.08.025. PMID 26416706. Fuchs, J.; Pons, J.M. (2015). "A new classification of the pied woodpeckers assemblage (Dendropicini, Picidae) based on a comprehensive multi-locus phylogeny". Molecular Phylogenetics and Evolution. 88: 28–37. doi:10.1016/j.ympev.2015.03.016. PMID 25818851. Fuchs, Jérôme; Pons, Jean-Marc; Bowie, Rauri C.K. (2017). "Biogeography and diversification dynamics of the African woodpeckers". Molecular Phylogenetics and Evolution. 108: 88–100. doi:10.1016/j.ympev.2017.01.007. PMID 28089840. Gorman, Gerard (2004): Woodpeckers of Europe: A Study of the European Picidae. Bruce Coleman, UK. ISBN 978-1-872842-05-9. Koenig, W.D. ; Haydock, J. (1999). "Oaks, acorns, and the geographical ecology of acorn woodpeckers". Journal of Biogeography. 26 (1): 159–165. doi:10.1046/j.1365-2699.1999.00256.x. Lemaitre, J.; Villard, M.A. (2005). "Foraging patterns of pileated woodpeckers in a managed Acadian forest: a resource selection function". Canadian Journal of Forest Research. 35 (10): 2387–2393. doi:10.1139/x05-148. Michalek, K.G. ; Winkler, H. (2001). "Parental care and parentage in monogamous great spotted woodpeckers (Picoides major) and middle spotted woodpeckers (Picoides medius)". Behaviour. 138 (10): 1259–1285. doi:10.1163/15685390152822210. Shakya, S.B. ; Fuchs, J.; Pons, J.-M.; Sheldon, F.H. (2017). "Tapping the woodpecker tree for evolutionary insight". Molecular Phylogenetics and Evolution. 116: 182–191. doi:10.1016/j.ympev.2017.09.005. PMID 28890006. Stark, R.D. ; Dodenhoff, D.J. ; Johnson, E.V. (1998). "A quantitative analysis of woodpecker drumming" (PDF). Condor. 100 (2): 350–356. doi:10.2307/1370276. JSTOR 1370276. Webb, Daniel Matthew; Moore, William S (2005). "A phylogenetic analysis of woodpeckers and their allies using 12S, Cyt b, and COI nucleotide sequences (class Aves; order Piciformes)". Molecular Phylogenetics and Evolution. 36 (2): 233–248. doi:10.1016/j.ympev.2005.03.015. PMID 15869887. Wiebe, K.L. ; Swift, T.L. (2001). "Clutch size relative to tree cavity size in northern flickers". Journal of Avian Biology. 32 (2): 167–173. doi:10.1034/j.1600-048X.2001.320210.x. Yom-Tov, Y.; Ar, A. (1993). "Incubation and fledging durations of woodpeckers" (PDF). Condor. 95 (2): 282–287. doi:10.2307/1369350. JSTOR 1369350. Wikimedia Commons has media related to Picidae. "Woodpecker" . The American Cyclopædia. 1879. "Woodpecker" . The New Student's Reference Work . 1914. Chester, Tim (March 3, 2015). "Here's a photo of a weasel riding a woodpecker". Mashable. UK.